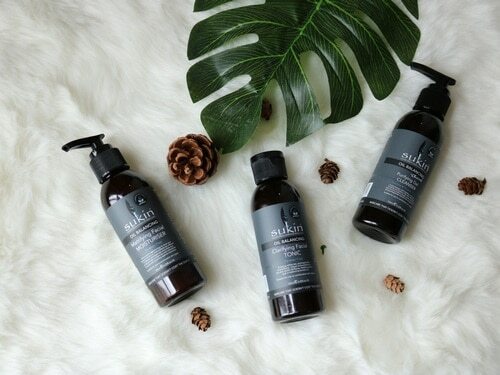 Today in this busy world, spirituality has gained huge momentum and people across the world are discovering various ways to attain inner peace. Spirituality, which means finding our innerself and connecting to our creator has become an important aspect of our life. No doubt we all believe in supreme power which has created us and this wonderful world. 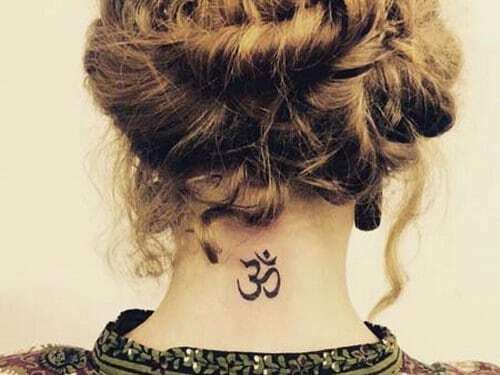 This small belief in God has created a special place for spiritual ink. 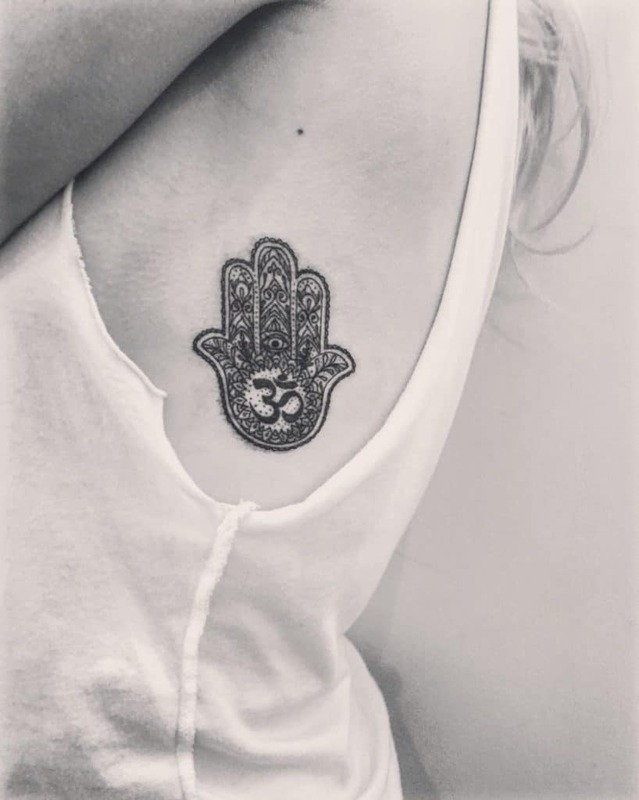 People ink themselves with sacred and holy symbols which inspires them and bring some positive vibes in their life. There are various spiritual symbols and Om symbol is one of the most popular in them. It is the most sacred symbol of hinduism, jainism, sikhism. 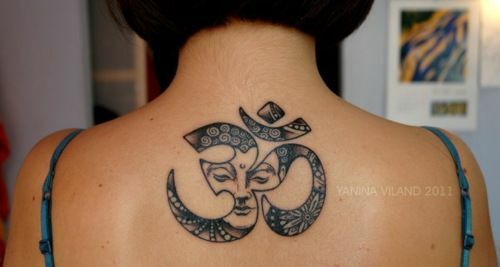 Today in our post we would be talking about 50 best Om tattoo designs ideas for men and women. 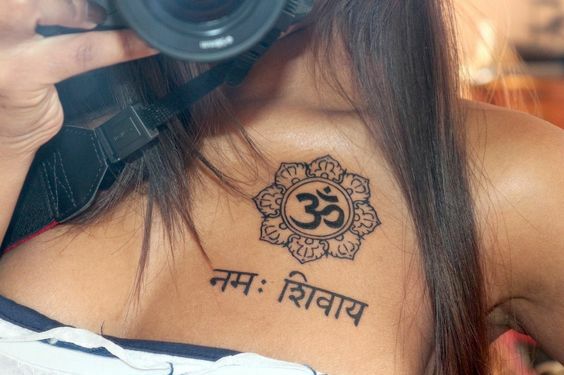 Om is a mystic sound and a beautiful symbol with deep meanings. 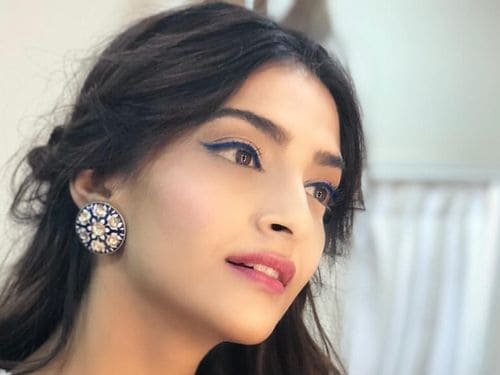 The importance of Om can be realized from the fact that one can prominently find this symbol in various sacred religious texts and upanishads. It is a cosmic sound which is associated with the creation of universe. The below image briefly describes each bit of the symbol. 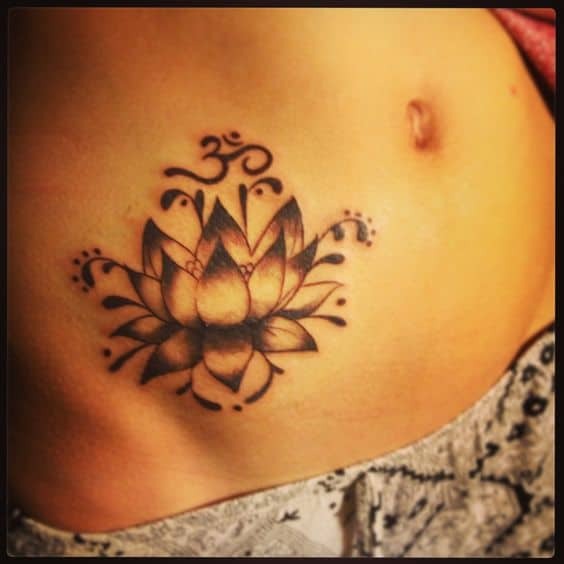 So read on to find 50 best Om tattoo designs ideas for men and women. 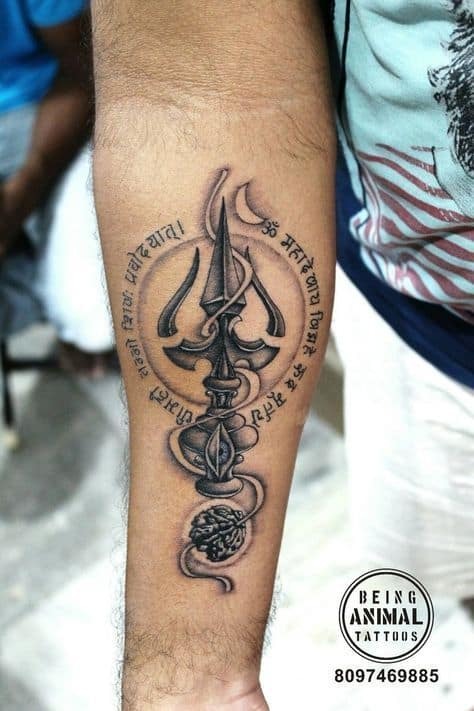 A classic black Om tattoo designs depicting a Shivling. 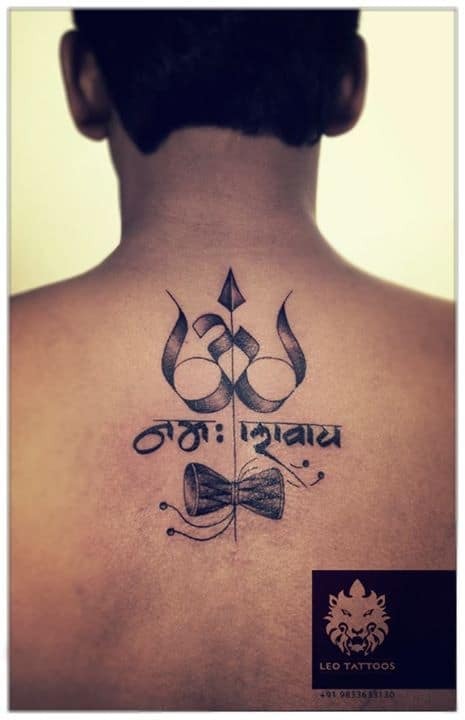 The tilak on the Shivling has been creatively drawn into an Om symbol. At the top of the shivling a trishul is placed, in which the powerful third eye of Lord Shiva is also drawn. 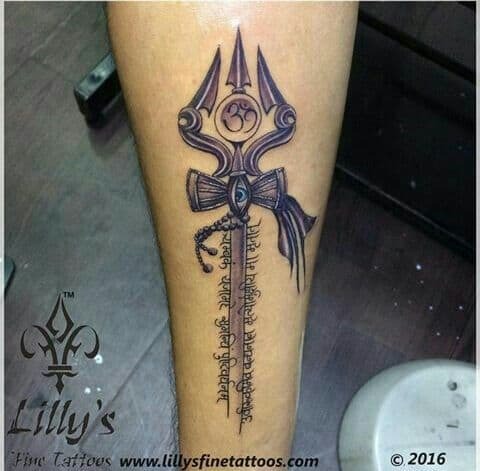 This tattoo smartly combines all the Shiv elements. 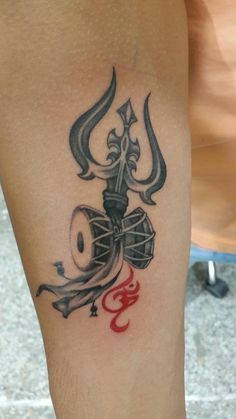 A trishul wrapped up with Om symbol, best pick for the forearm. It is short and concise but with deep meaning. If you are a devotee of Lord Ganesha and Shiva. 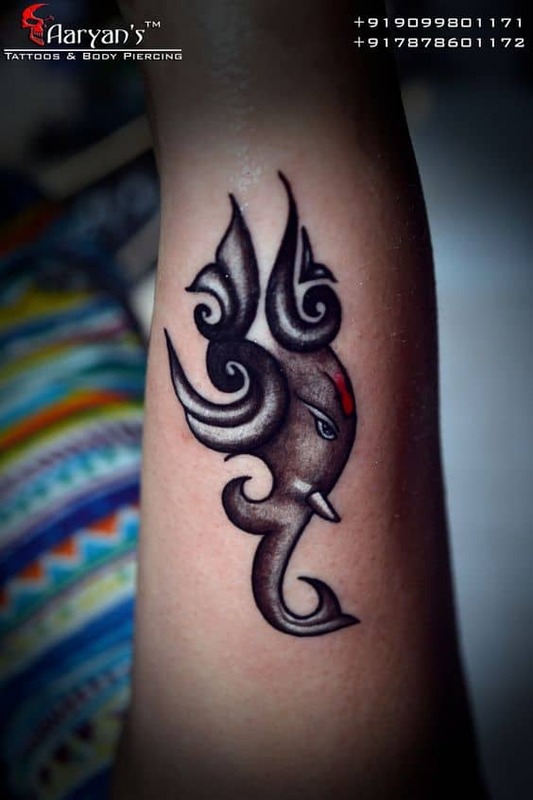 Then you can show it to the world with this beautiful Lord Ganesha design. Here the head and ear of the Ganesha are made creatively with Om symbol. The red tilak has added a pinch of color in it. If enchanting mantras have become an important part of your life, then why not try this beautiful mandala art. Here the powerful Om mantra is encircled with Gayatri mantra. To add more beauty to it the mantras are bordered with mandala designs. The symbol Om is associated with lord Shiva who is also known as Mahakaal. The word Mahakaal means beyond time and death. 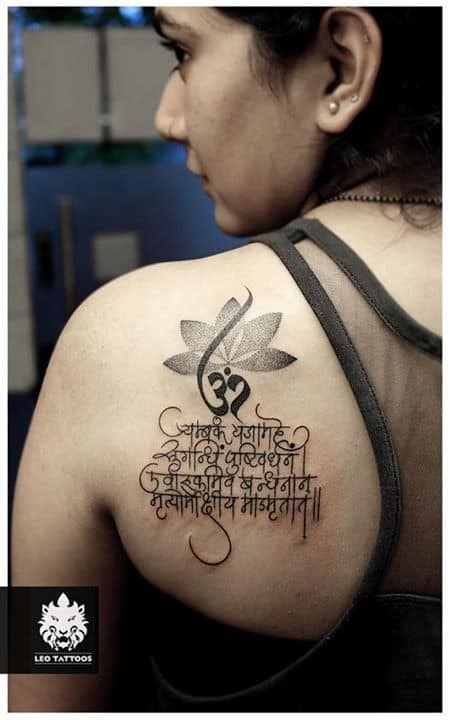 The word mahakaal in this tattoo design is written quite interestingly. Here the word M also depicts the symbol Om. It also has a third eye drawn in it. The worship of Lord Shiva is incomplete without enchanting the holy mantra Om Namah Shivay. The thrisool has been beautifully placed in between the holy symbol Om. 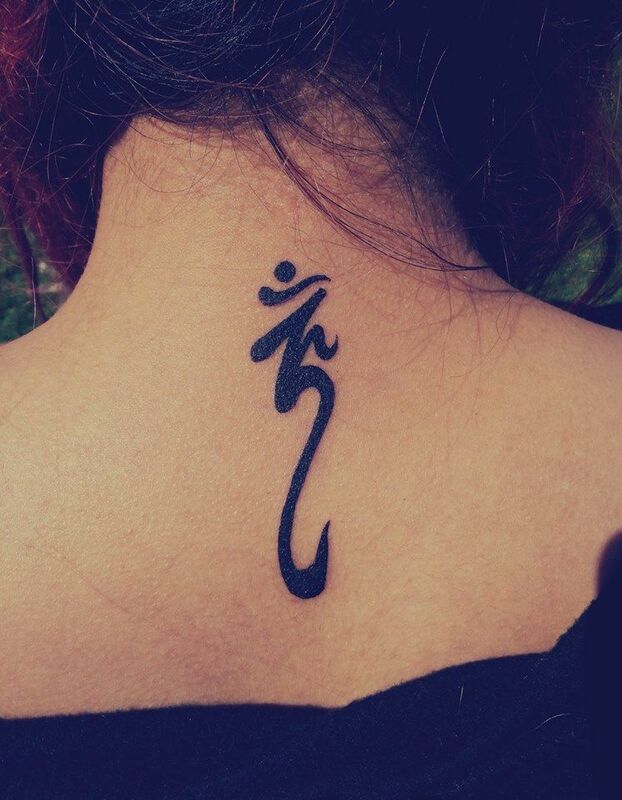 The symbol Om also find an important place in buddhism religion. In all the Buddhist mantras you will find they start with Om. 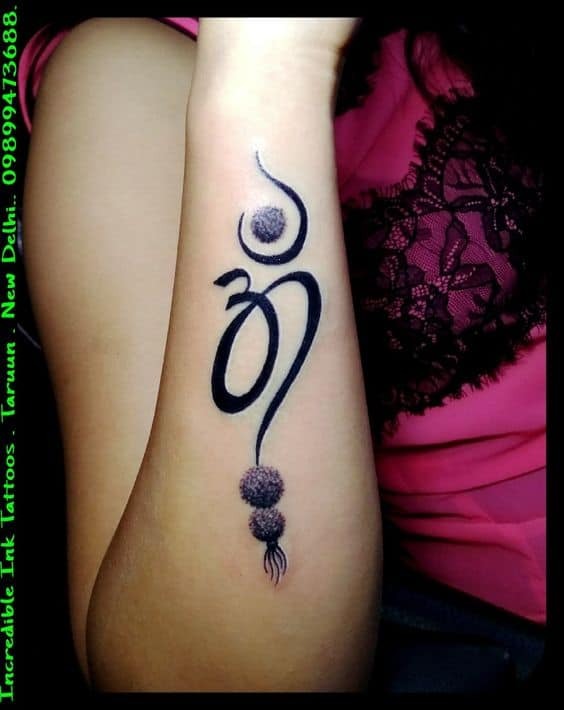 The majestic Om tattoo with beautiful sketch of lord Buddha face. This design will require a good amount of space so that you can add all the details. Nandi is the vehicle of lord Shiva and bearer of truth and righteousness. 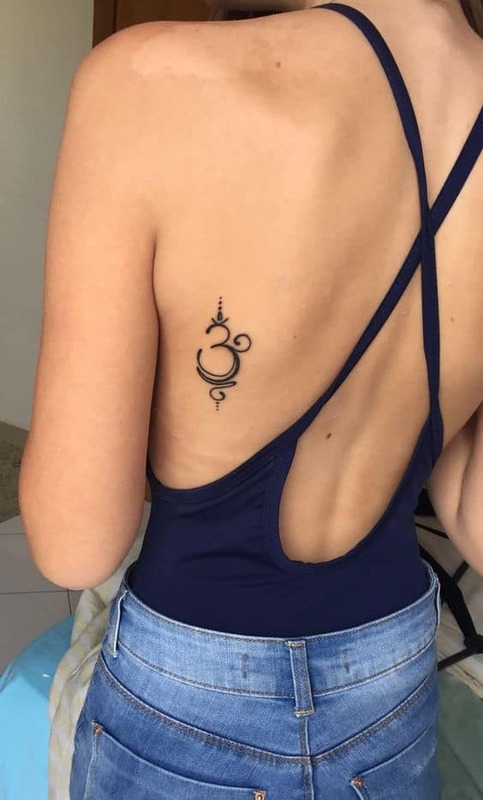 Here in this tattoo you can find a trishool, third eye, Nandi and the symbol Om. 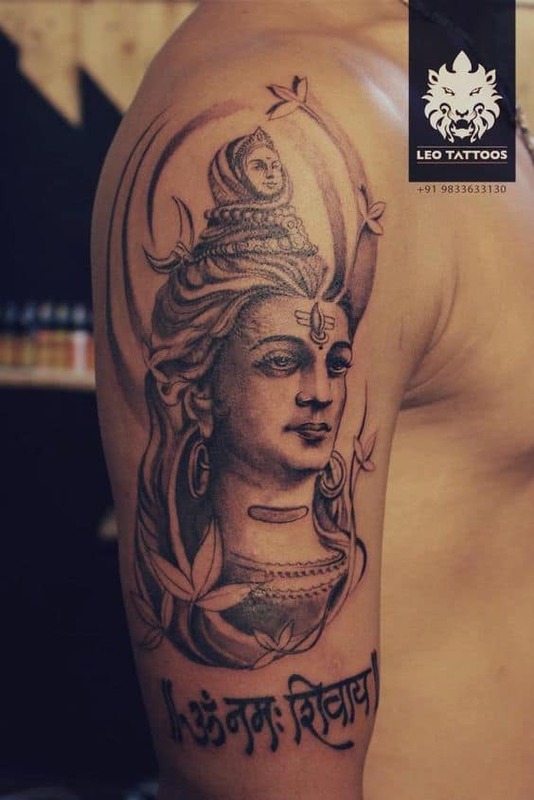 If you are looking for a large shiva portrait tattoo your search may end here. This tattoo is perfect for your forearm. The word Mahadev is used for Lord Shiva which means supreme. 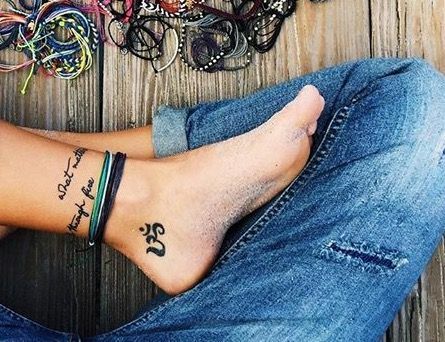 A simple Om symbol has its own kind of beauty. 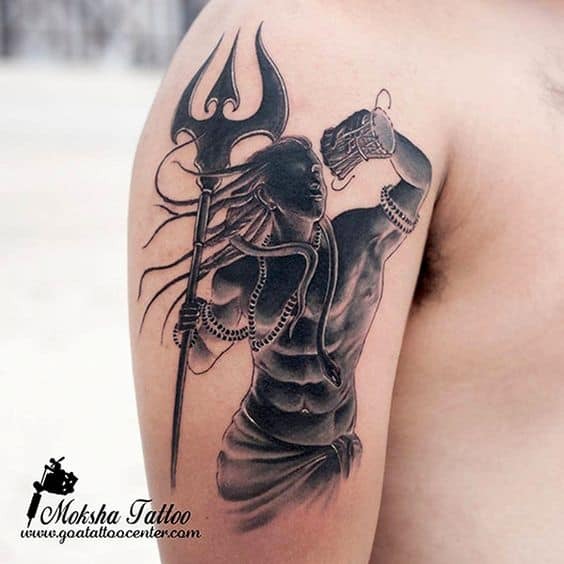 The tattoo itself is a masterpiece the lord Shiva image looks so real and powerful. 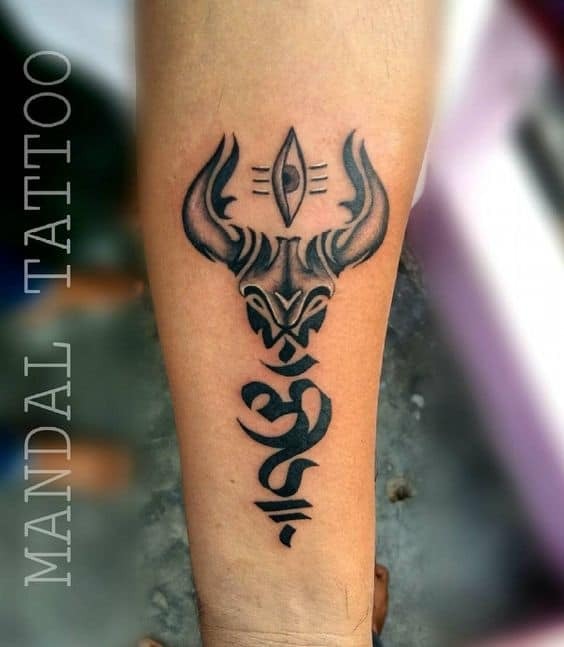 If you are fond of mini tattoo you can also try this one. 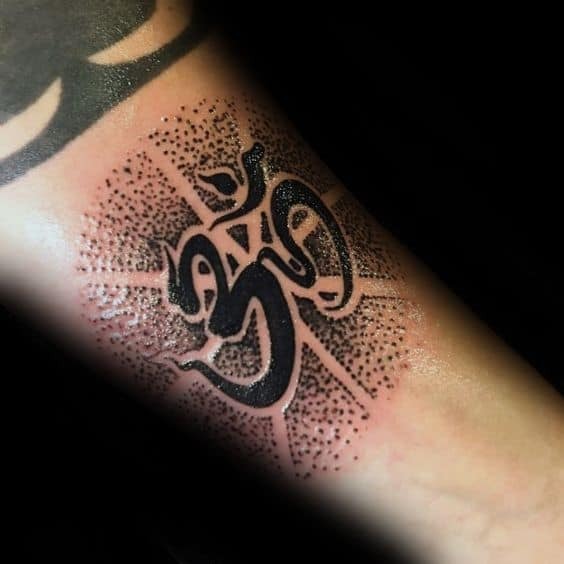 You can also try this interesting Om design surrounded with beautiful shaded pattern created with dots. Another bold pattern which depicts power. 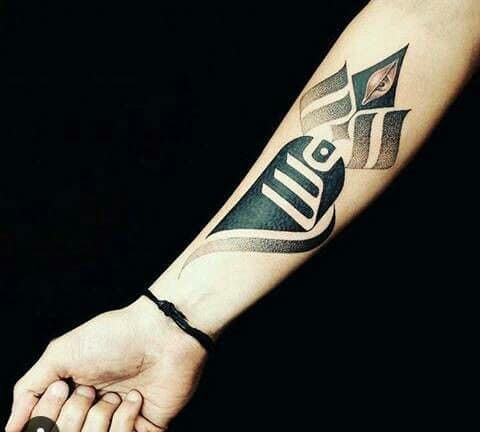 The design is perfect to be placed in forearm. 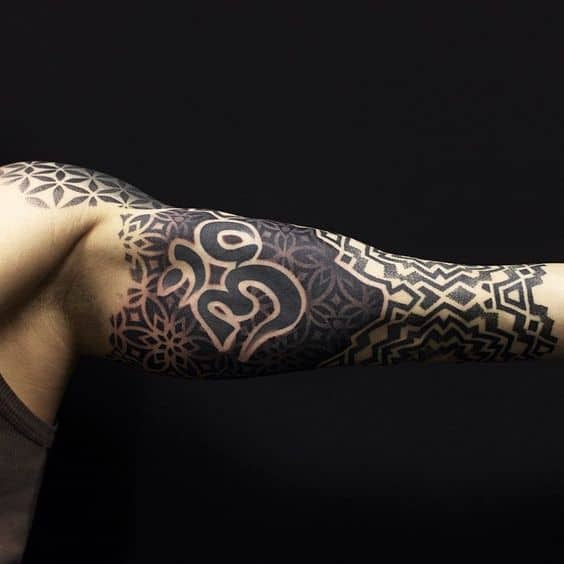 Showcase your spirutality with this elaborate tattoo sleeve design. 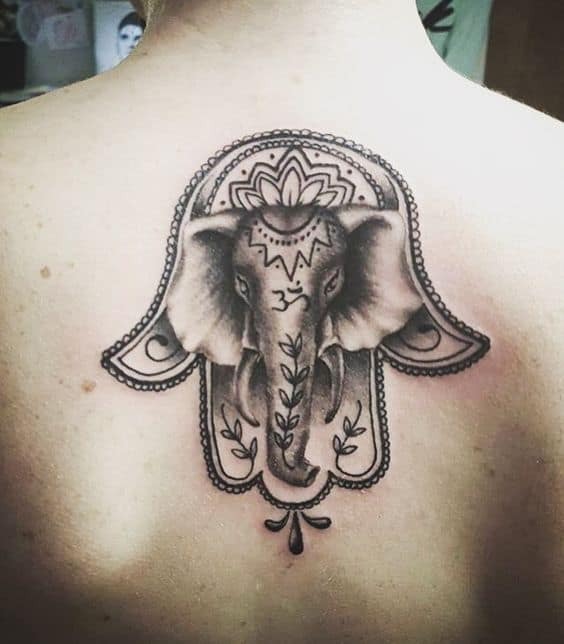 Elephant is a powerful symol of luck and also represents wisdom. 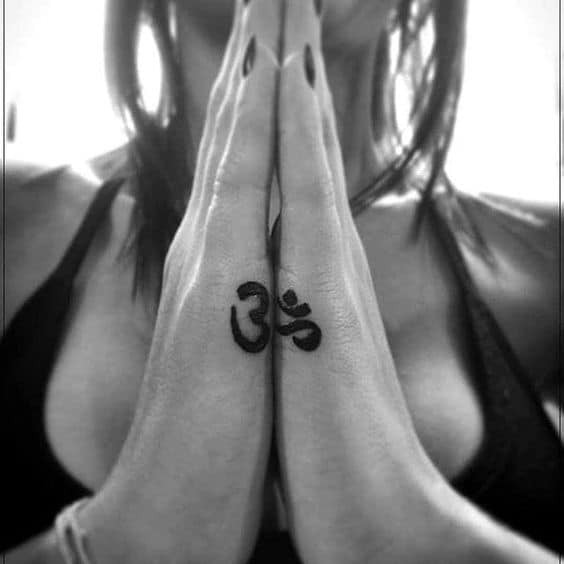 The word Om means past, present and future. 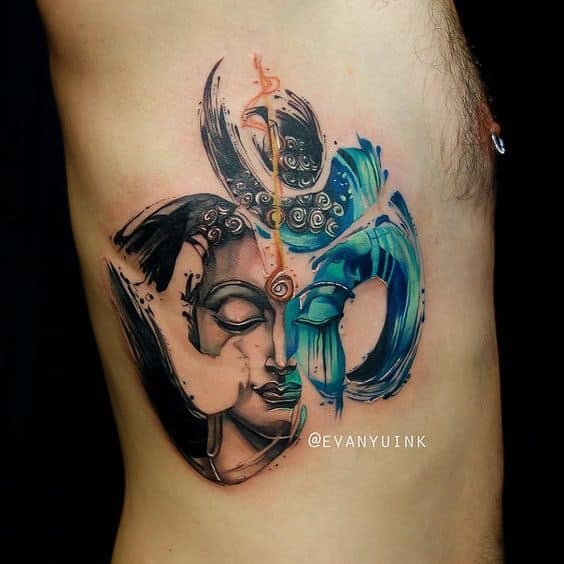 So combining these two elements together makes up for a divine tattoo design. 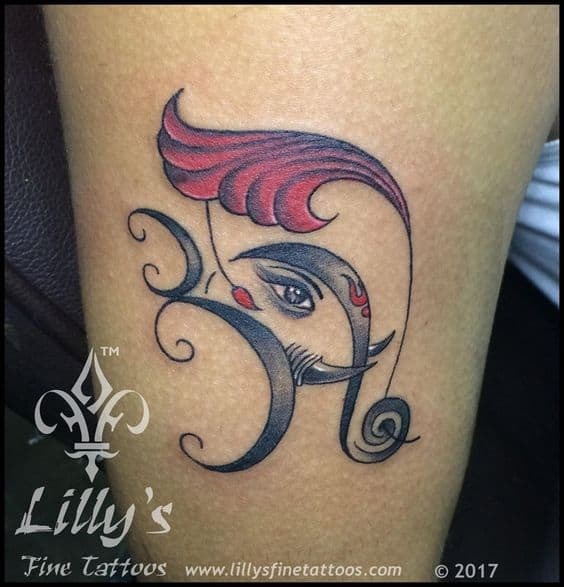 The beautifully drawn Om symbol in red ink adds highlight to this whole tattoo design. 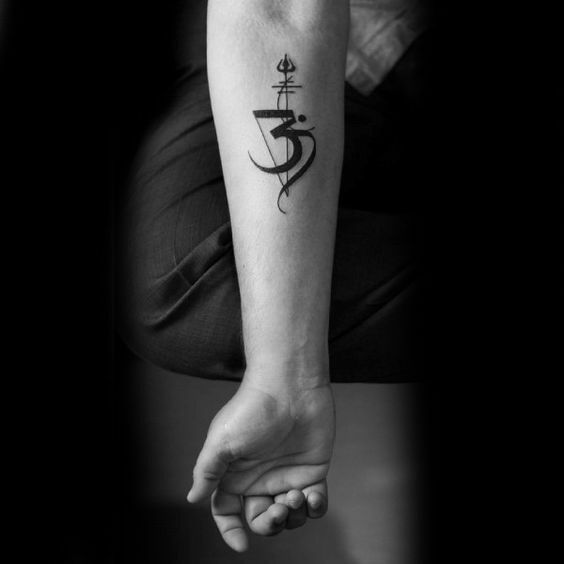 The beautiful tattoo design in black and grey with a majestic Om symbol drawn into it. 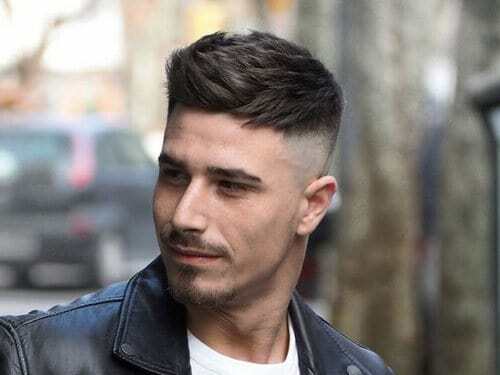 This design can be beautifull placed at the back. The trishool is creatively designed to form the powerful Om symbol. 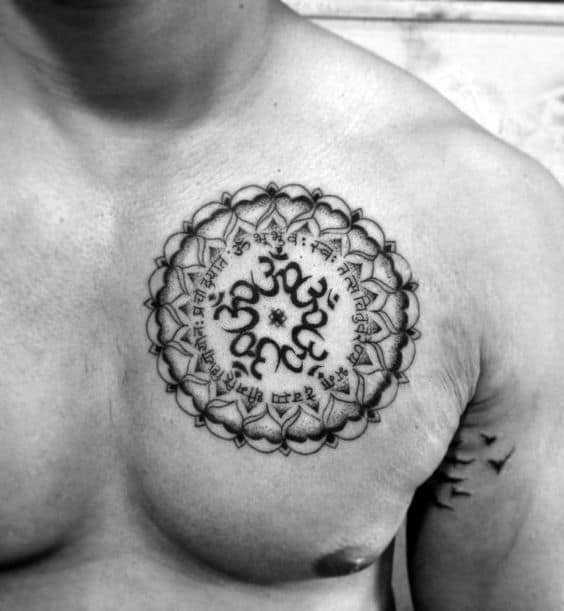 The mystic Om tattoo design is surrounded by beautiful shaded dots. 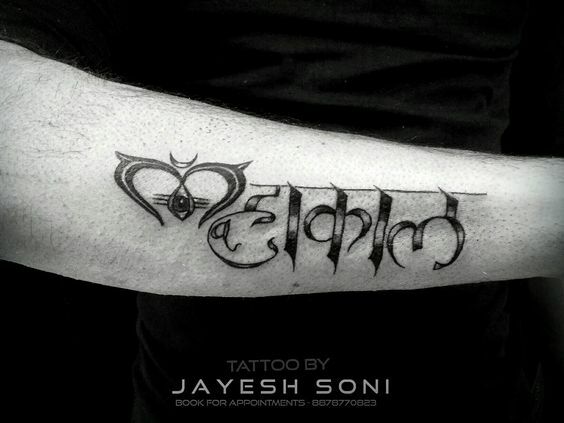 Want to add some more to this divine symbol, try this design which has Mahamritunjay mantra added to it. 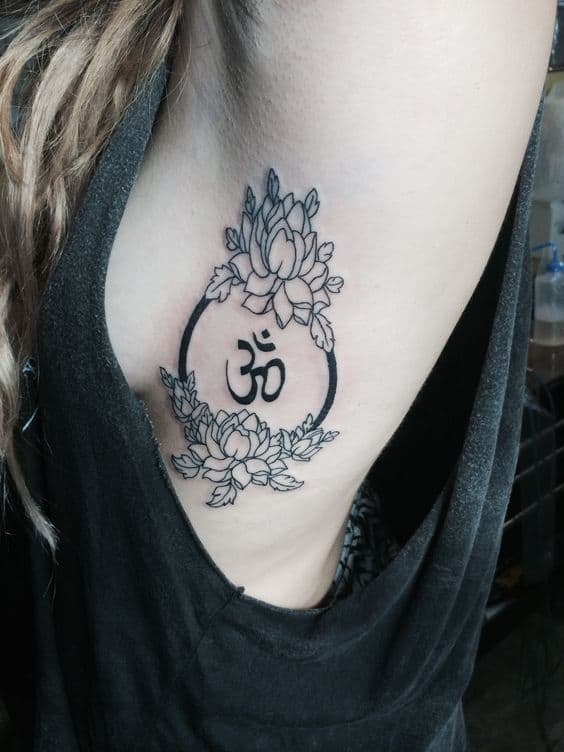 You can also try the Om tattoo in vintage style. You can add more elements to your Om symbol. 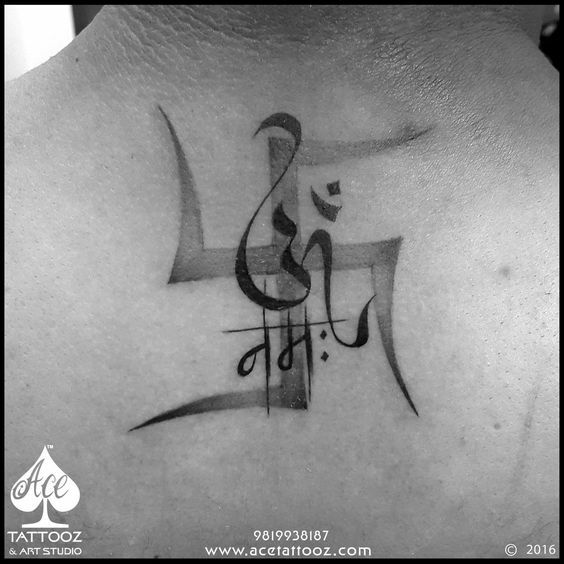 Like Swastik which means pure and auspicious. 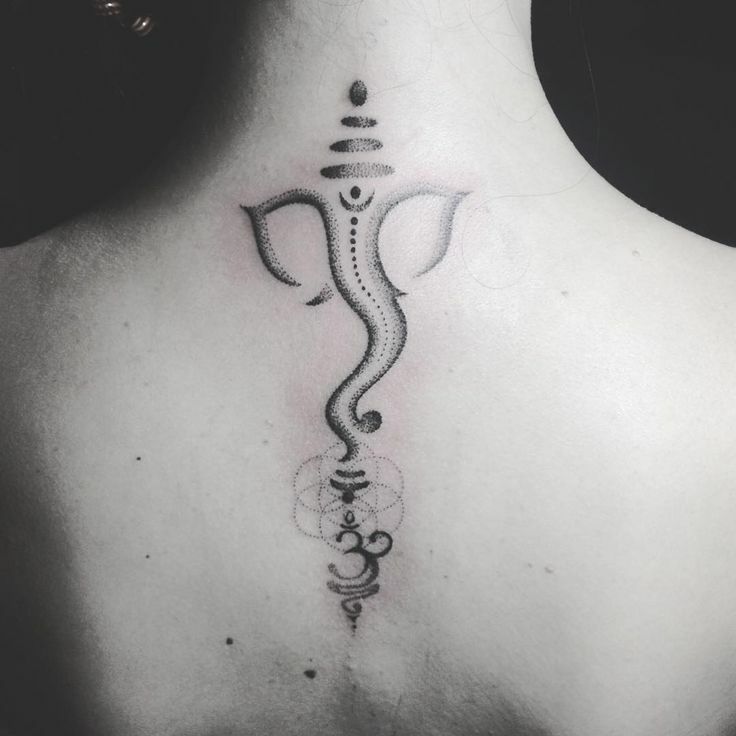 The backside of the neck is one of the favourite place to ink tattoos. 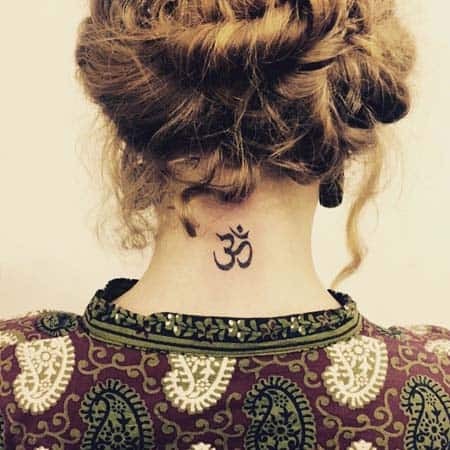 Try this cute Om tattoo at the back of your neck which also has spiritual signficance. 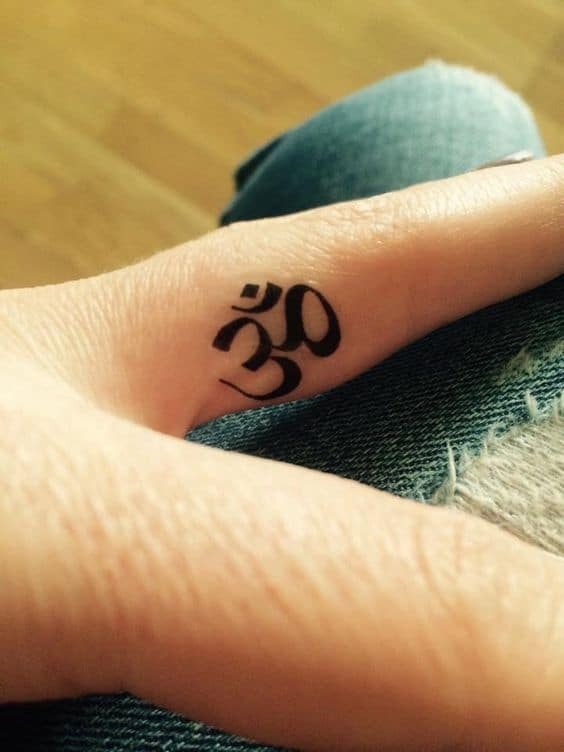 The tiny Om design in the finger looks pretty well. You can easily look at it whenever you like. 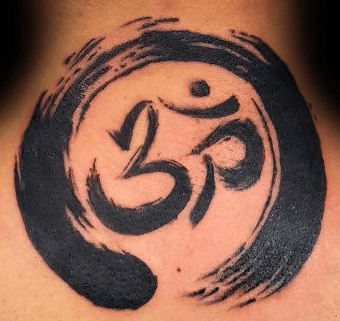 You can also try this creative Om tattoo design which has three elements in it. 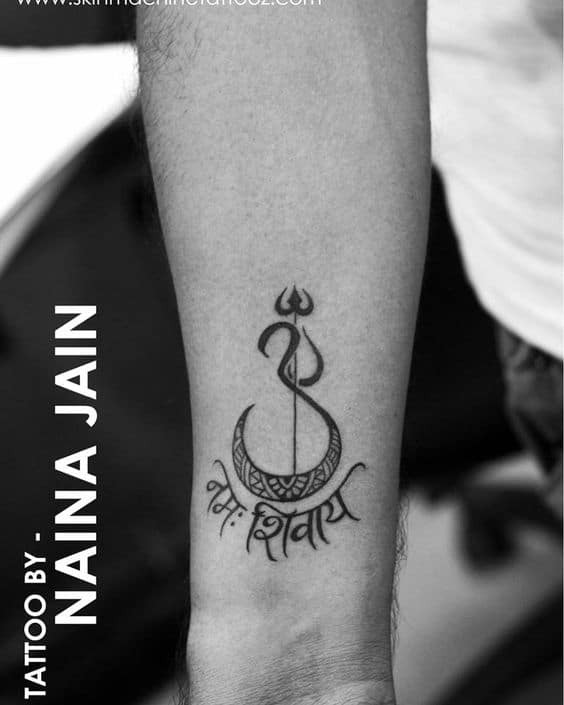 The trishool, swastik and the Om symbol itself. 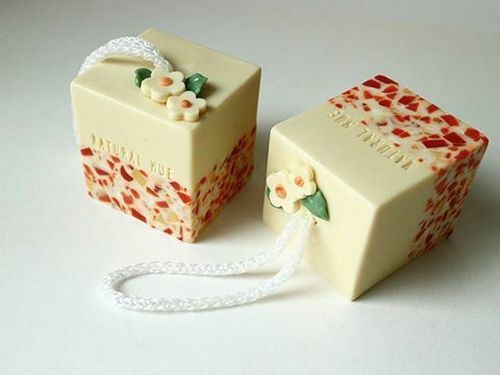 Lotus symbolises beauty and purity. It is said that the spirit of the best man is spotless like lotus flower. 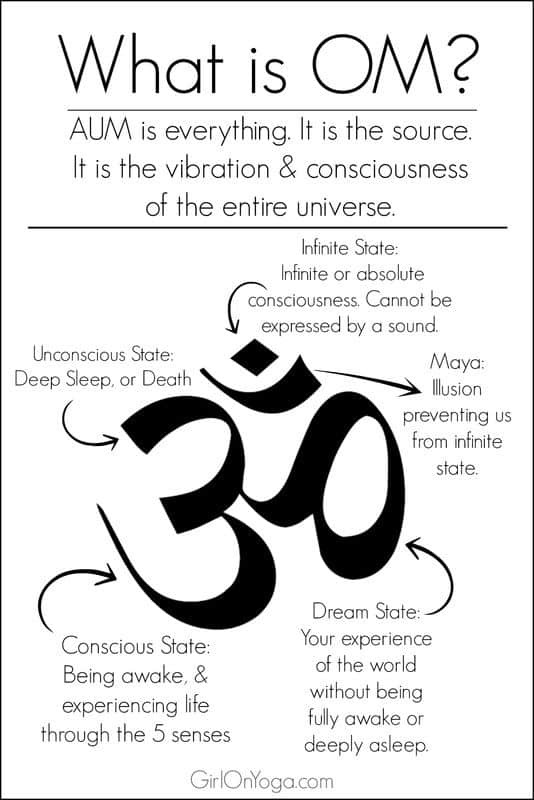 Om is the representation of sound, vibration and consciousness of the universe. 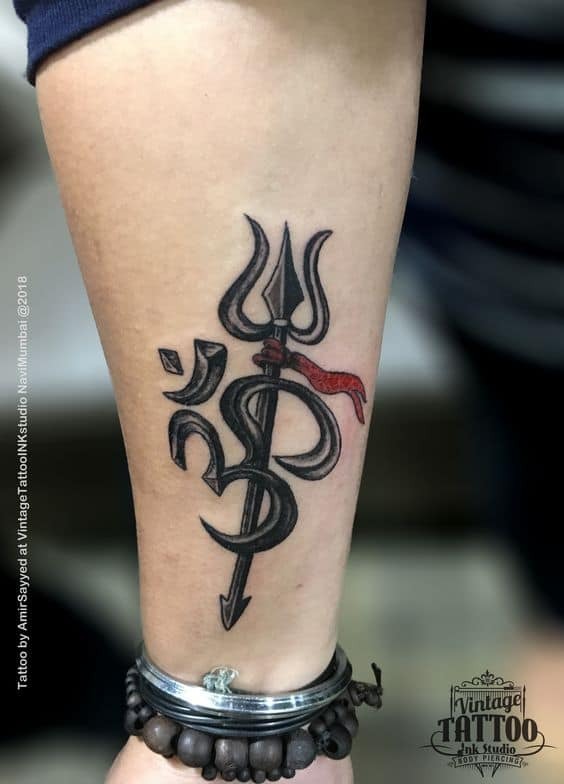 Adding Rudraksha to your tattoo design has great symbolic meaning. It is believed that by wearing Rudraksha bead one gets protected by lord Shiva. 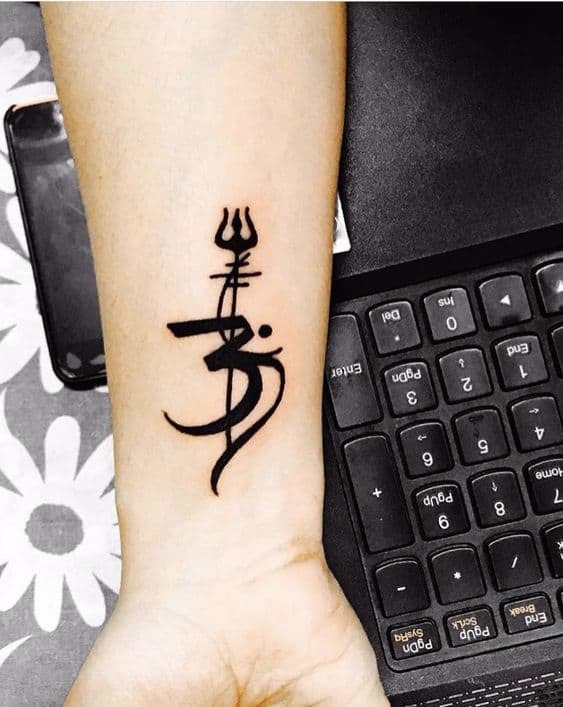 This is an amazing mini tattoo in which the half of the symbol is inked on one hand and remaining half symbol on the other hand. The symbol gets completed when you join your both hands. 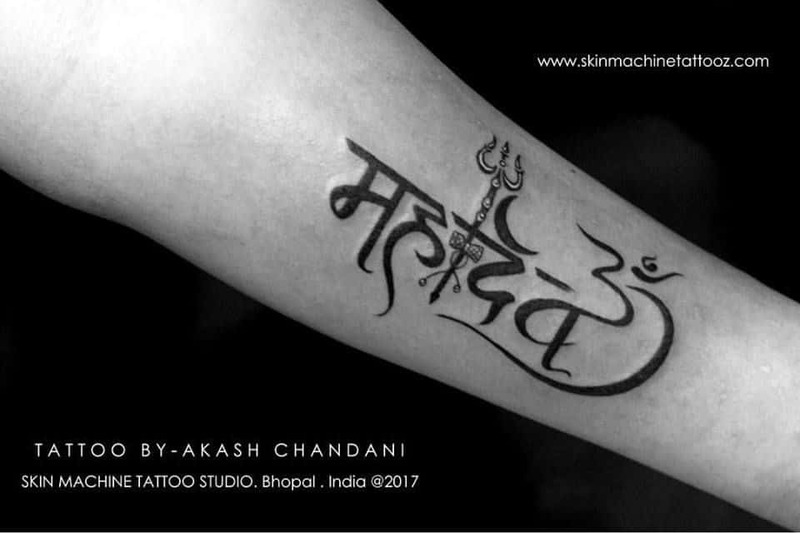 You can try this creative Om tattoo which also has a small trishool added to it. It is a concept in Zen Buddhism meaning beginner’s mind. It refers to an attitude of openness, eagerness and lack of preconceptions. 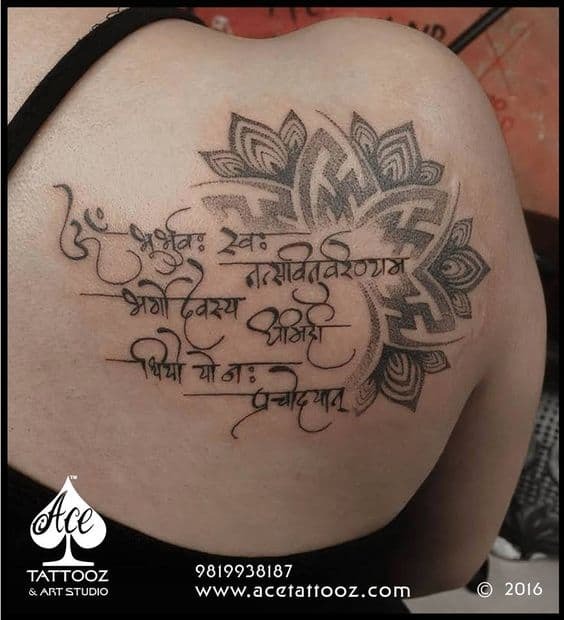 If you are looking for a large tattoo design try this beautiful mandala art with Gayatri mantra. It not only looks aesthetically beautiful but also conveys deep meaning. 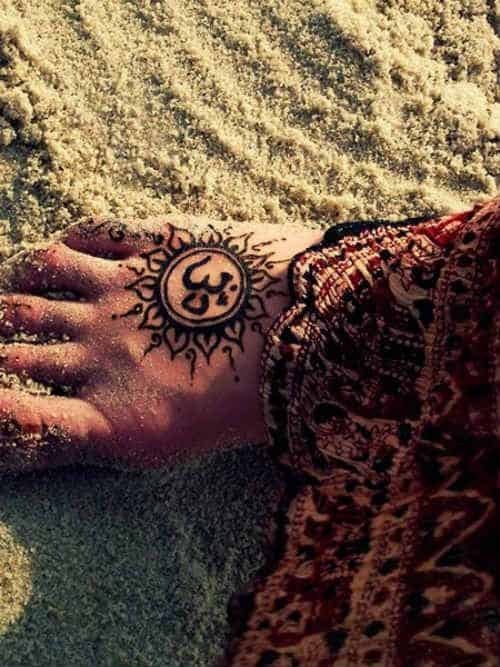 If you are a yoga lover you can also try this Om design in feet. You can also try this interesting tattoo design which also has beautiful feather attached at the bottom. 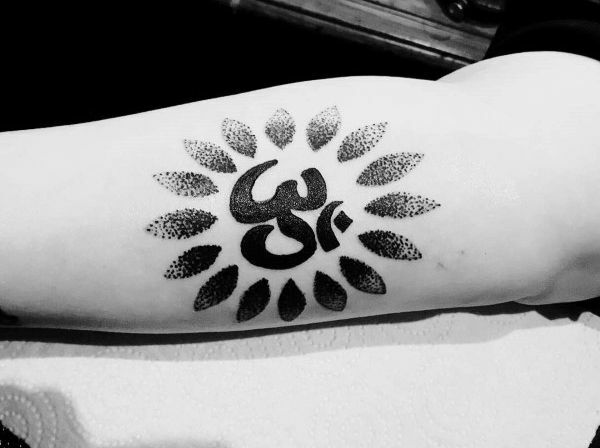 You can also create your own style statement with this beautiful Om symbol. 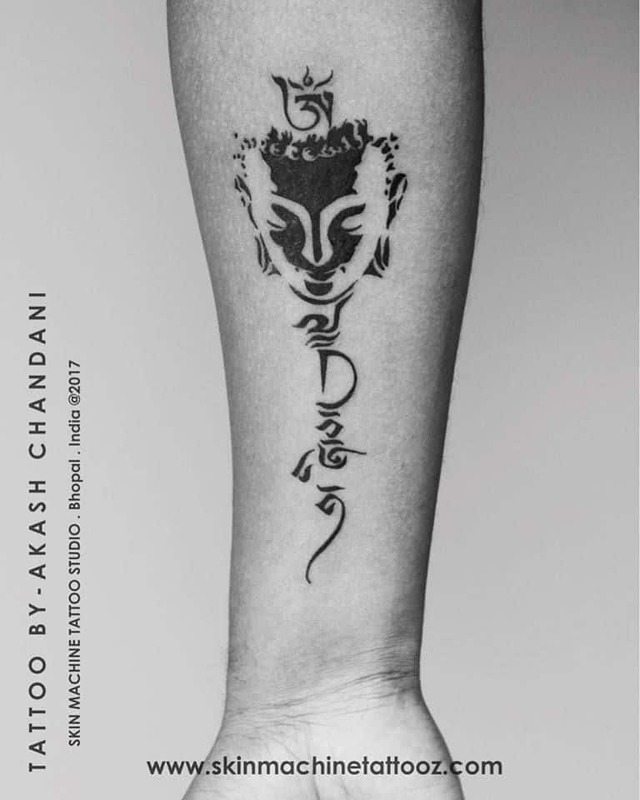 You can try this beautiful tattoo of Om with Lord Buddha face incribed in it. 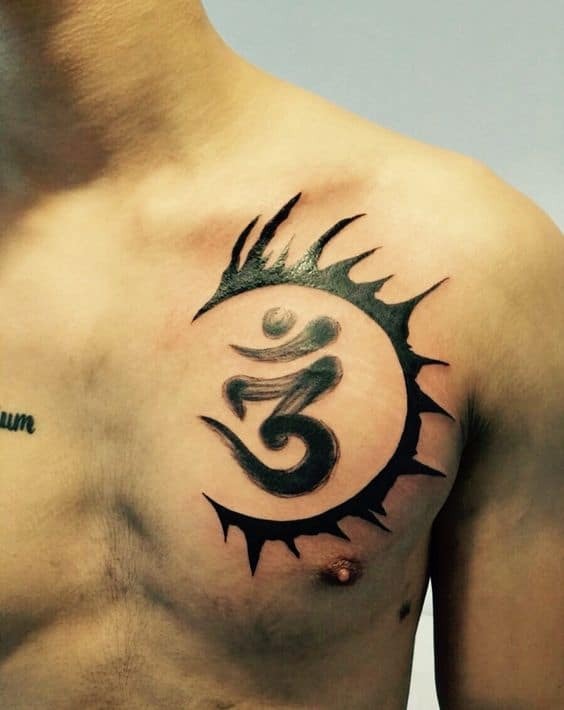 Looking for a plain Om tattoo, this can be your final search. 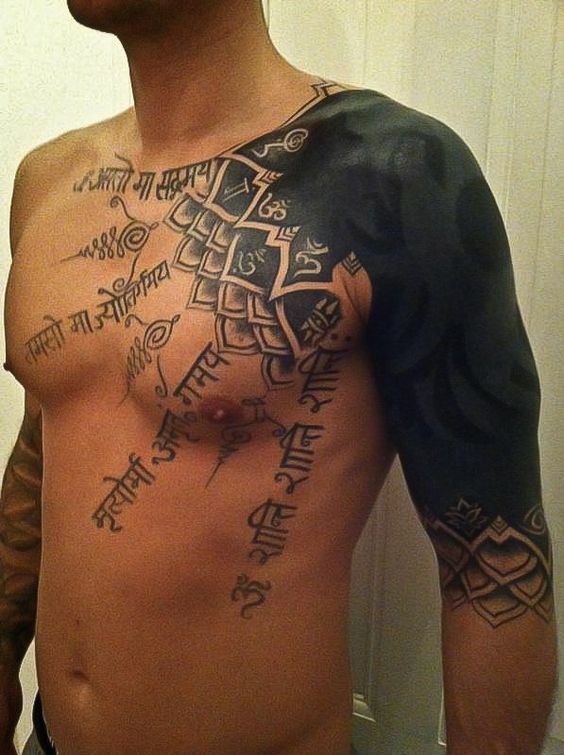 The black and gray tattoo gives bolder appearance to any design. The intricate filling inside the lotus flower makes it a delight for an eye. The design of Om symbol looks so mystic and divine. 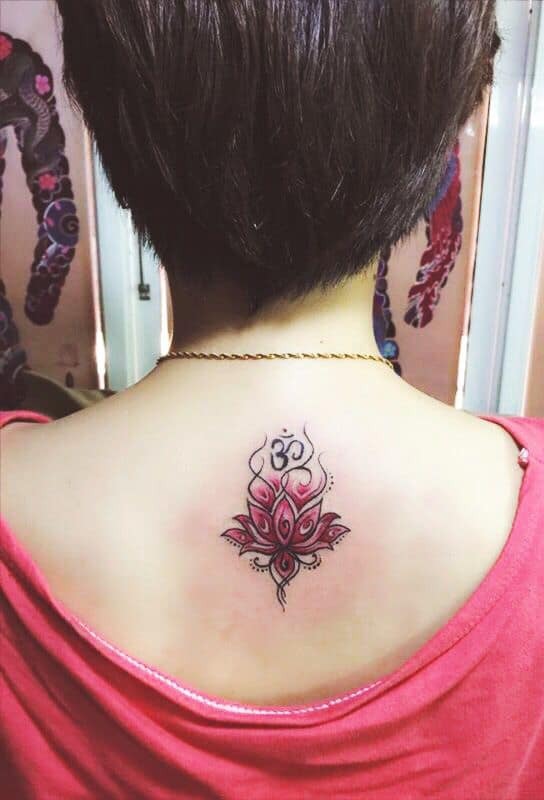 The beautiful pink colored lotus tattoo looks so amazing. 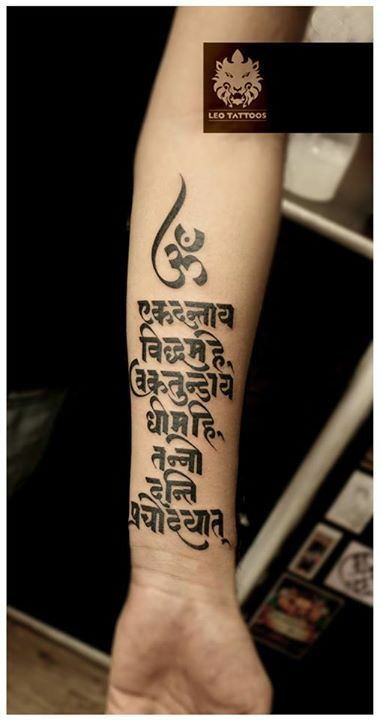 If you are a devotee of Lord Ganesha then why not ink this ganesha mantra. 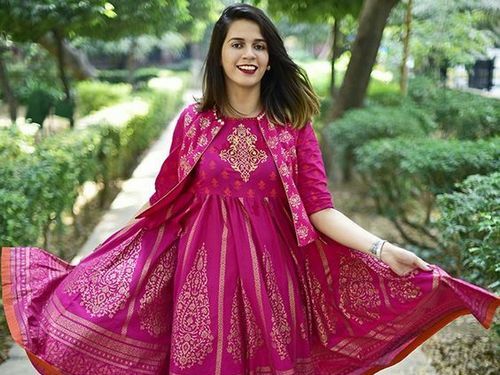 The beautiful Om design which you can easily flaunt in off shoulder. This mantra is believed to be quite powerful and protects from unnatural deaths and diseases. 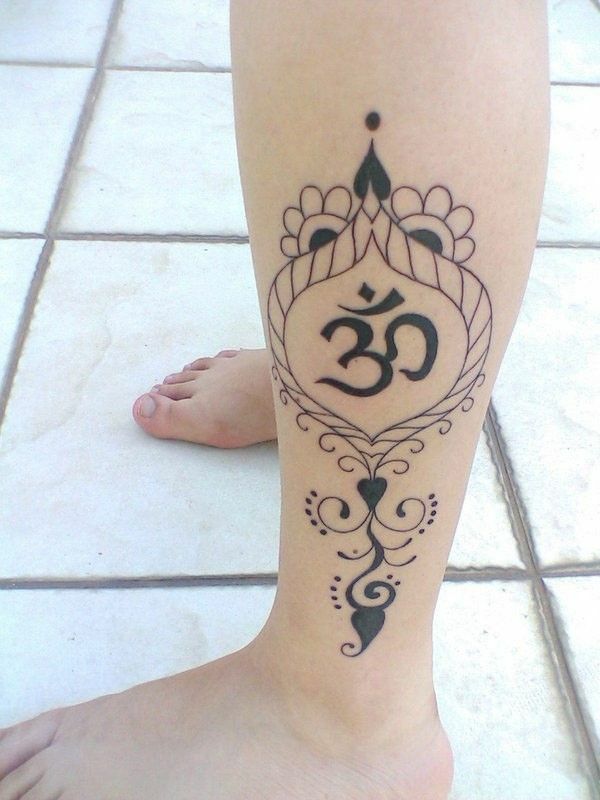 The magnificient leg tattoo with divine Om symbol decorated with traditional art. 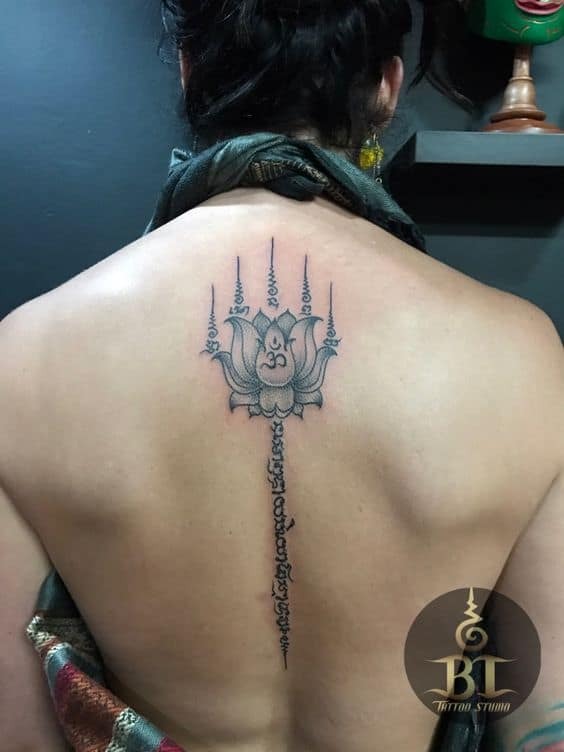 The full size back tattoo with Om symbol and lotus flower inked in it. 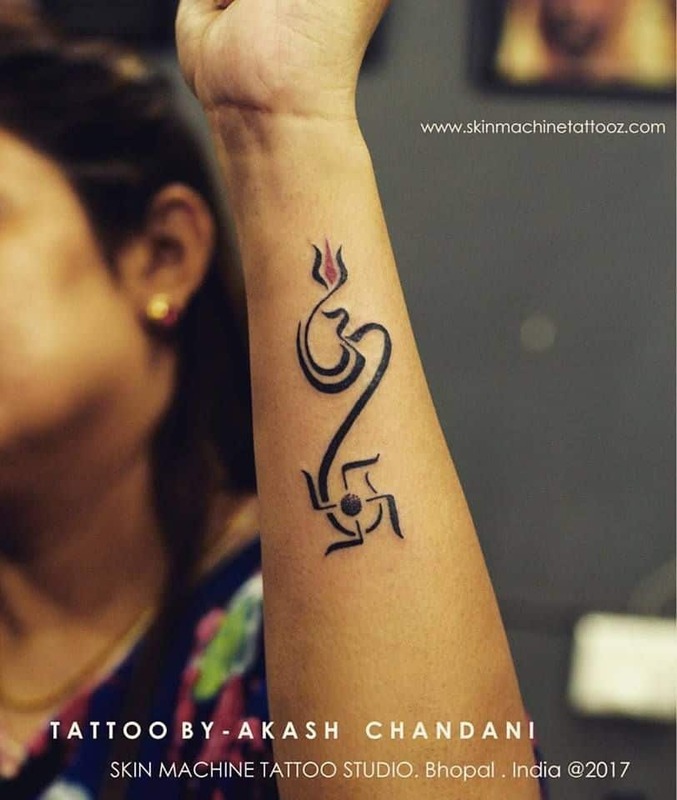 The mighty lord ganesha tattoo with the symbol Om inked beneath it. Tiny tattoos are easy to pick as they can be easily covered when you don’t want to flaunt them. They also look very cute. 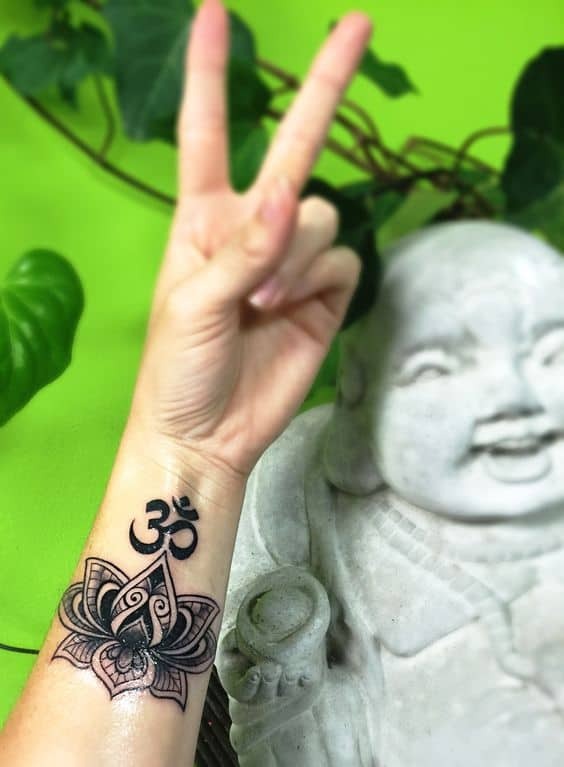 Are you thinking of going for a spiritual ink. 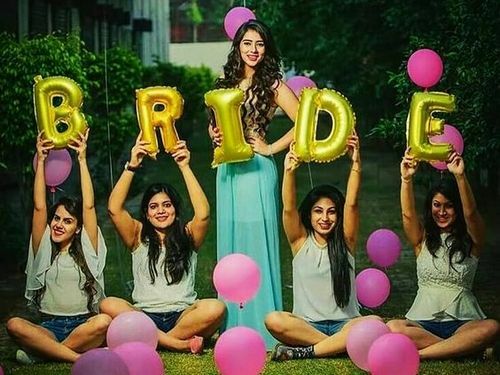 Do share with us your ideas on it. 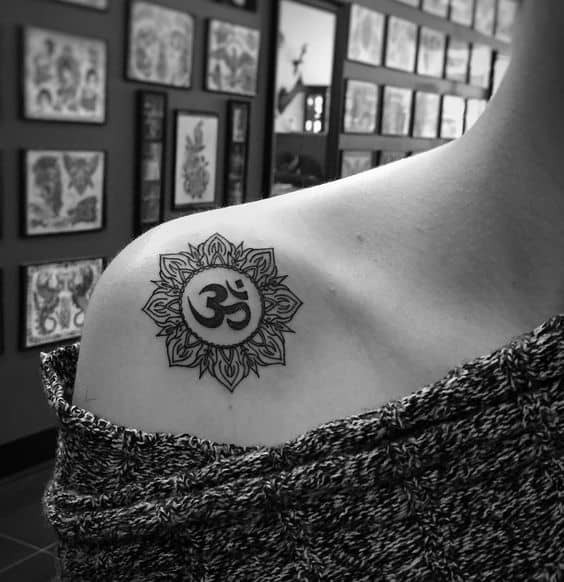 Hopes this list of 50 Om tattoo designs ideas for men and women helps you in finalising any design.